Vesta Networks provides web conferencing and and teleconferencing services for Bayshore Healthcare's complex branch network of over 60 offices, 45 clinics and 13 specialty pharmacies. Bayshore HealthCare is one of Canada’s largest national providers of community health care services with the capacity to consistently deliver a wide range of offerings to our customers from coast to coast. With over 50 years of providing service to communities across Canada, starting in home health care, it is now a major provider of services in Therapy & Rehabilitation as well as Specialty Pharmacy Services. Bayshore's branch network of over 60 offices, 45 clinics and 13 Specialty Pharmacies (comprising 11,000 employees) are effectively led and managed at the local level through a decentralized management approach. However, this creates a high degree of complexity when it comes to communication across this complex network. We needed to conduct online meetings, train nursing staff via webinar, and communicate effectively via telephone and web conferencing at a moments notice, at all times of the day. In short, complex needs for a complex organization! Bayshore has been working with Vesta for over 15 years. We rely on Vesta's web and teleconferencing systems to facilitate business for our 11 thousand employees across Canada. Conference calls through Vesta have played a key role in new program roll outs, and have allowed us to easily provide training to our field nurses. Vesta helps us to communicate effectively with our decentralized leadership team, and to work collaboratively across all 3 divisions of Bayshore Healthcare. Bayshore depends on Vesta's conference call services to ensure smooth communication to our Pharmaceutical Manufacture clients as well, along with all staff, delivering care to Patients and their families. Vesta's quick response time has proven invaluable to our organization. 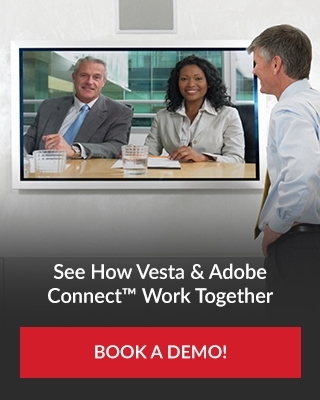 We've worked closely with Vesta to customize our web conferencing and conference call services to our unique needs.